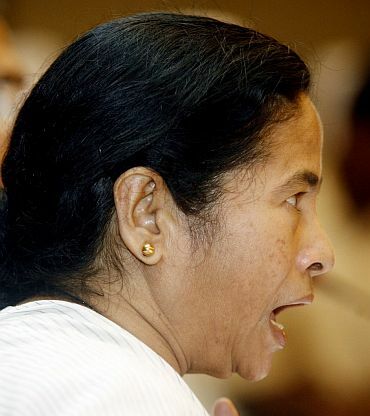 The stormy petrel of West Bengal politics, Mamata Banerjee has single handedly wrecked the red bastion in West Bengal ending Left Front's uninterrupted 34-year-old rule after perfecting the art of the impossible. 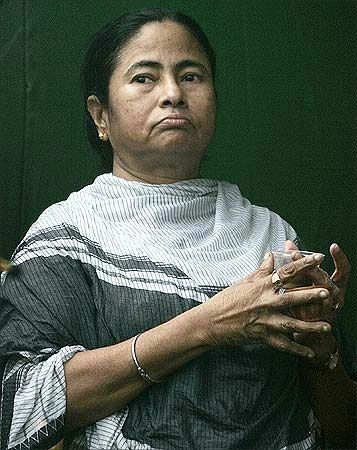 The feisty 56-year-old Banerjee, who is the founder and chairperson of the Trinamool Congress which she set up in 1998 after falling out with the Congress Party in West Bengal, can now have the satisfaction of a victorious General seeing all the war plans fall into place. For years the face of the Opposition in West Bengal, Banerjee, known to her supporters as 'Didi' (sister) has been the nemesis of the ruling CPI(M)-led Left Front over the last 23 years and has earned the reputation of being a street-fighting politician. Maverick and emotional, she first hogged the limelight by blocking Jayaprakash Narayan's convoy by throwing herself on the ground when he came to Kolkata to organise the masses against Indira Gandhi before Emergency. Banerjee, a firebrand orator, coined a catchy slogan "Ma, Mati o Manush" (Mother, Land and People) before last year's Lok Sabha polls and played on the anti-incumbency factor after more than three decades of Left rule and the creeping disillusionment among several sections, like Muslims, to decimate the Left in partnership with the Congress. A leader with mass appeal known for her humble lifestyle, the seven-time MP successfully sold a vision of development, cashing in on the deep resentment among the middle classes and unemployed youths, promising jobs and development. Her nondescript residence -- a tiled single-storey house in a dingy lane close to the Kalighat temple -- and equally simple attire comprising cotton saris, jhola bags and cheap hawai chappals, endeared her to the masses. Banerjee had to shoulder multiple responsibilities -- political strategist, union minister, chief poll campaigner and trouble shooter in her focus to dislodge the world's longest democratically-elected communist government in a state. It has not been an easy journey though for the current Union Railway Minister who turned her call for 'Parivartan' (change) into a reality with ally Congress throwing its full weight behind her. 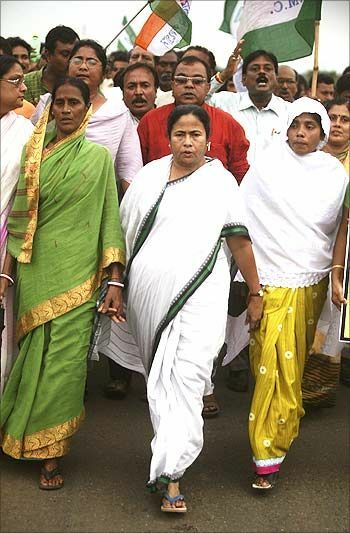 But her energy, charisma and political astutenes made Banerjee one of the few mass leaders in the country. As a 29-year-old, Banerjee shot to limelight by pulling off a stunning victory over CPI-M heavyweight and now expelled party leader Somnath Chatterjee in the 1984 Lok Sabha elections in the Jadavpur constituency to become one of the youngest MPs. Born to a lower middle class family and daughter of freedom fighter Promileswar Banerjee, she entered politics by joining the Chhatra Parishad, the student wing of Congress, while studying at the Jogmaya Debi College in Kolkata in the 1970s. Graduating to party politics, Mamata was general secretary of the West Bengal Mahila Congress in 1979-80 and subsequently held other posts in Congress. Losing her seat in an anti-Congress wave in 1989, she was back in the Lok Sabha in 1991 from Kolkata South and also won the subsequent elections in 1996, 1998,1999, 2004 and 2009 from the same constituency. Banerjee's first tryst with the corridors of power came in 1991 when she became became Union Minister of state for Human Resources Development, Youth Affairs and Sports and Women and Child Development in the P V Narasimha Rao government. But in 1996, she fell out with the Congress, calling it a 'stooge of CPIM'. 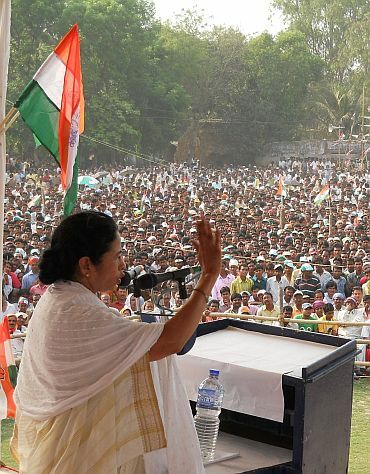 Two years later, she formed the Trinamool Congress and quickly emerged as the dominant opposition party. In 1998 and 1999, Banerjee's party won eight and seven seats in the Lok Sabha polls respectively and joined hands with the BJP, seen in party circles as a disastrous move in hindsight. During NDA rule under the Atal Bihari Vajpayee government, Banerjee was Railway Minister in 1999 and for Coal and Mines in 2004. She was also a union minister without portfolio for a brief period in 2003-4. She quit as railway minister and NDA in early 2001 in the wake of the Tehelka expose into defence deals to ally with Congress for the assembly elections in West Bengal, but could make no headway against the Marxists. Banerjee had to eat humble pie and return to the NDA and the Vajpayee cabinet in January 2004 to become Coal and Mines minister till the 2004 election. In 2004, her party MP tally plummeted to one -- just herself. Two years later, in the assembly election, Trinamool was routed, ending up with just 30 seats. A relentless fighter against the CPIM, Banerjee never gave up and bided her time. 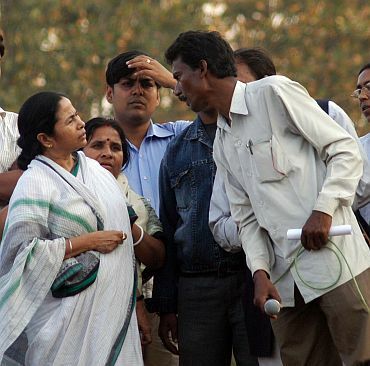 Her opportunity came when Nandigram and Singur exploded on the national scene. Since then it has been a story of her continuous rise. 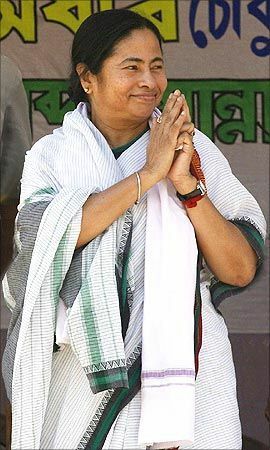 In November, 2006, Banerjee was stopped on her way to Singur in Hooghly district for a rally against the Tata Motors Nano car project, which was a turning point in the long-drawn agitation there with the Trinamool chief demanding that 400 acre of the around 1000 acre acquired be returned to farmers who were unwilling to part with their land. Banerjee also went on a fast for 25 days on a makeshift dais at busy Esplanade in Kolkata in protest against land acquisition at Singur, but called it off on December 28 following an appeal from Prime Minister Manmohan Singh. But this did not resolve the problem at Singur and the agitation there started with renewed vigour under Banerjee. Ultimately, the Tatas drove out of Singur in 2008. When the agitation against land acquisition was on at Singur, the West Bengal police fired on protestors on March 14, 2007 killing 14 people at Nandigram in East Midnapore district where the state government wanted to set up a Petroleum, Chemical and Petrochemical Investment Region (PCPIR) on farmland. 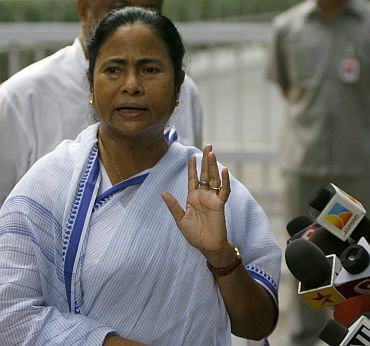 Banerjee took full advantage of the acquisition scare among the minorities in rural areas and her declared stand against special economic zones endeared her to a section of traditional Left Front supporters, who did not like hobnobbing with big capital. With her 'Ma-Mati-Manush' slogan, she hijacked the issues dear to the Left supporters -- pension, the insurance and banking sector, privatisation, land acquisition in Nandigram and Singur, Rizwanur Rahman's death and the Sachar Commission report. Banerjee played her cards so well that she won over certain sections that were gunning for her till the other day. She was wooed by industrialists and even Left parties. A staunch Left-wing party like SUCI, which has bases in pockets of Bengal, is now an ally of Trinamool Congress. They helped give a direction to Banerjee's brand of politics, which hitherto had a one-point agenda of blind opposition to the CPI-M. When Chief Minister Buddhadeb Bhattacherjee with his 'Brand Buddha' image started on the slippery path of industrialisation through the private sector, Banerjee checkmated him on every front. This brought her a series of electoral victories in the panchayat elections, municipal polls, Lok Sabha elections and a string of assembly bypolls after that. But her chances in 2011 was largely due to her continuing to project herself as leader of the poor and the rural have-nots, a friend of the minorities, a champion of inclusive growth and one genuinely interested in delivering the goods.